Stoever shut down the Stampede. - Christian Stoever shuts the door in a 3-0 shutout of Sioux Falls. The Phantoms faced Sioux Fall for the second time, just a day after being beat 4-1 by the same team. What a difference that 24 hours makes. In what looked like a total flip from the previous night, the Phantoms managed to beat the Stampede 3-0 and earned Christian Stoever his first shutout in the USHL. The Phantoms definitely looked like they had more energy to start the game. 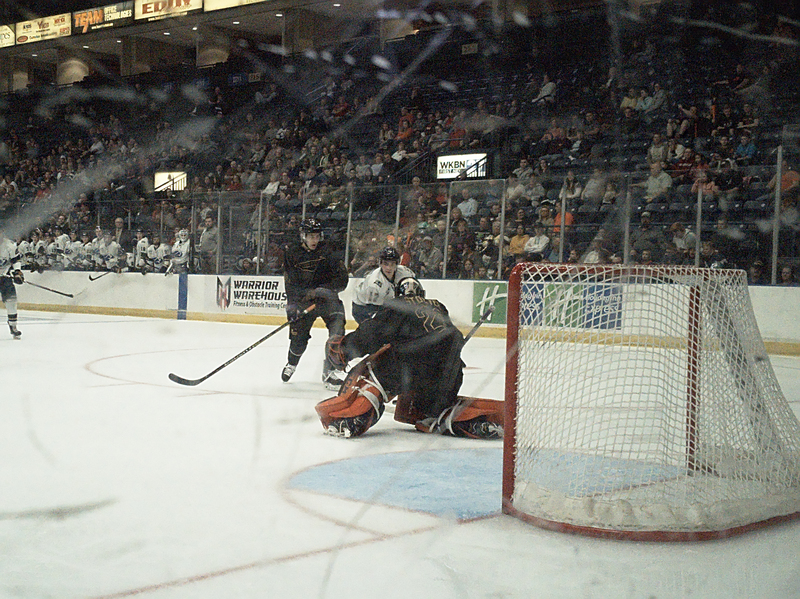 They put up the first goal of the game at 8:36 when Craig Needham took a shot on net that Stampede netminder Alec Calvaruso made the initial save but the rebound landed in the low slot, where Dalton Messina came crashing into a herd of defenders and jammed the puck passed the goaltender to put the Phantoms up 1-0. The Phantoms outshot the Stampede 11-6 in the first period. In the second frame, Brett Murray would score an unassisted, shorthanded goal when Calvaruso went behind the net to retrieve a puck dumped the length of the ice. Murray pursued the puck and stripped Calvaruso behind the net and managed to wrap it around for a goal with 0:30 left on the clock. Things turned scary when Calvaruso appeared to fall backwards trying to get back into the net with his legs and skate buckeling underneath his weight. The netminder was in very apparent pain writhing on the ice as his team and then additional medical staff from off ice attended to him. His skate had to be cut off and he was eventually helped off the ice, not able to skate under his own power or put any pressure on his leg. The refs ended the period early and the final half minute was played after the intermission break. Shots were 13-7 in favor of the Stampede during the middle frame. In the third, the Phantoms managed to seal things up with a Gianfranco Cassaro goal. On the rush, Connor MacEachern hit the offensive-minded defenseman with a pass and Cassaro shot the puck which tipped off of the Stampede winger Ethan Philips, changing the trajectory of the puck so it went up and right inside the net behind the crossbar, beating Jaxson Stauber who was in net to replace Calvaruso. Shots were 9-8 Phantoms in the period and tied at 27 per side for a game total. The Phantoms got a big win with over 1,800 in the building. With both Chicago and Cedar Rapids winning one and losing one this weekend, the points race for second place remains the same with Cedar Rapids playing a Sunday game at Green Bay to make up the game in hand they have over Chicago and us. That means next weekend could get very dramatic for these three clubs. Dalton Messina crashes the crease for a goal! Gianfranco Cassaro gets a lucky bounce off an unlucky defender!